Like many organizations, a world famous greeting card giant faced recruiting challenges with their workforce – particularly those on the front lines of customer service and inside sales. In 2002 they had come to the conclusion they needed to improve their selection process. According to the Corporate Staffing Director, he had read several articles in the Electronic Recruiting News that made a lot of sense to him and seemed to speak to his needs. 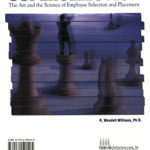 Authored by industrial psychologist Dr. Wendell Williams, Managing Director of Scientific Selection out of Atlanta, GA, the content of articles was around validated assessment systems that increased organizational performance. In early 2003, Dr. Williams spent time building the assessment system and training staffing team members in running the program. This allowed the company to do the testing themselves, administering a comprehensive test system including cognitive, simulation, behavior-based interviewing, keyboarding (practical), and motivational fit. Although the company’s hiring needs have not been as high as their peak a few years ago, they are still using the system two years later and continue to measure results.